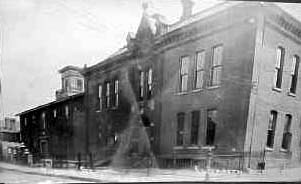 To view a larger image click on that particular image... for a brief description of the image place your cursor on the image. 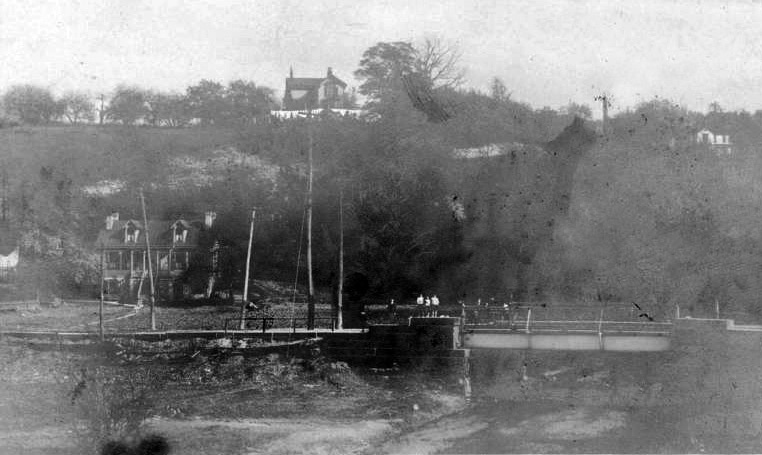 This could be showing the bridge over Fallen Timber Creek, just outside the downtown area. 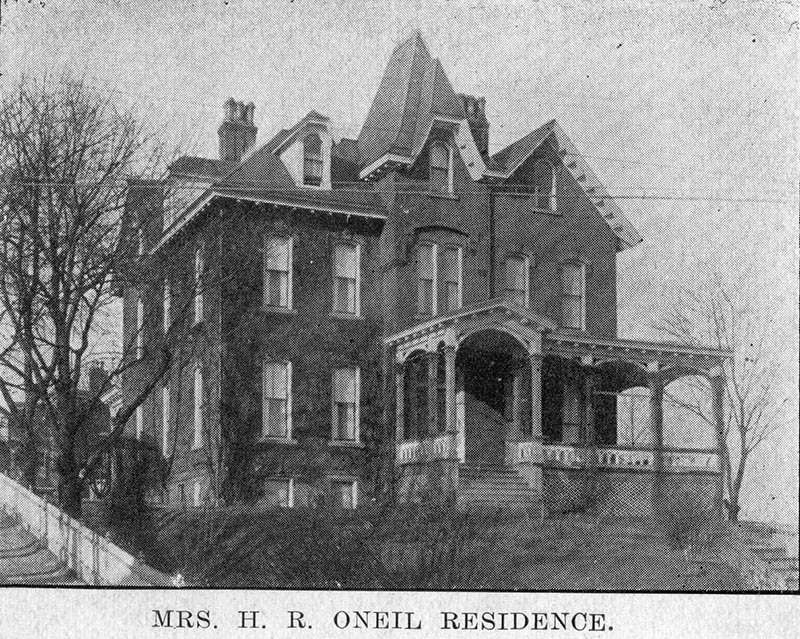 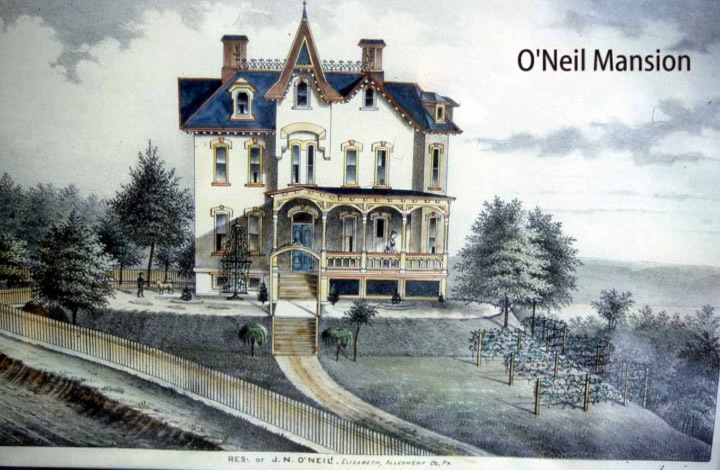 These lithographs show the Neil Brother's homes located in the area known as "Town Hill" and show these homes next to each other. 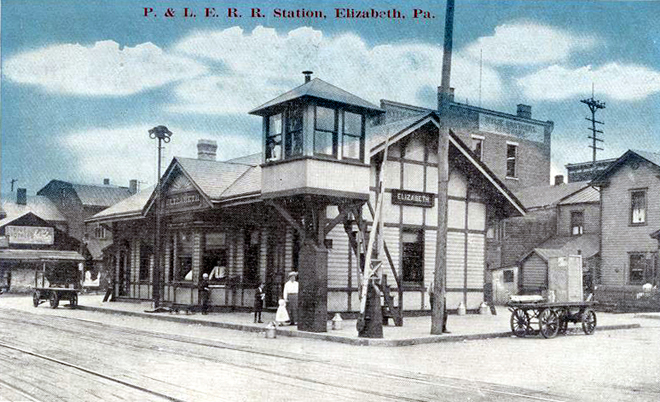 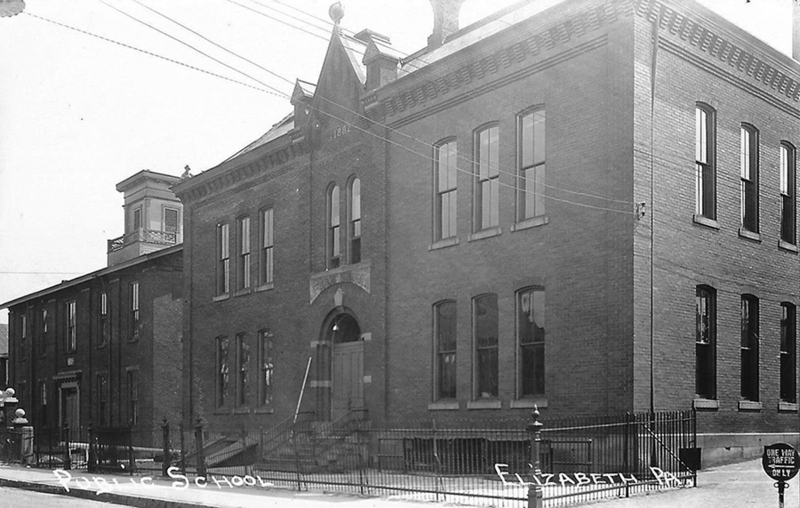 This property was eventually used for the Elizabeth High School for many years. 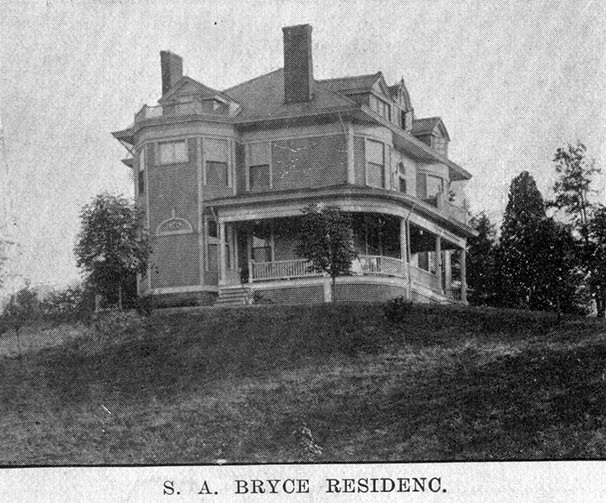 The second drawing on the right is the same home as shown on the left side of the first drawing but from a different angel. 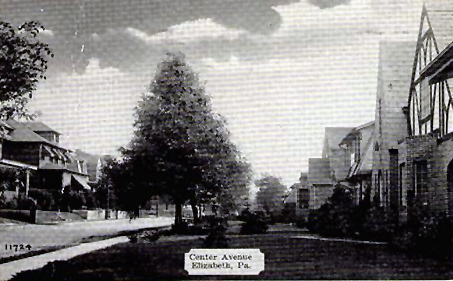 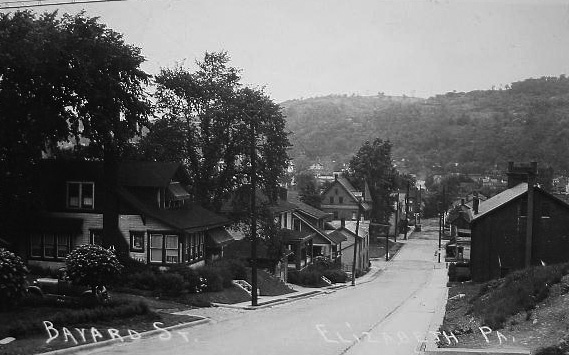 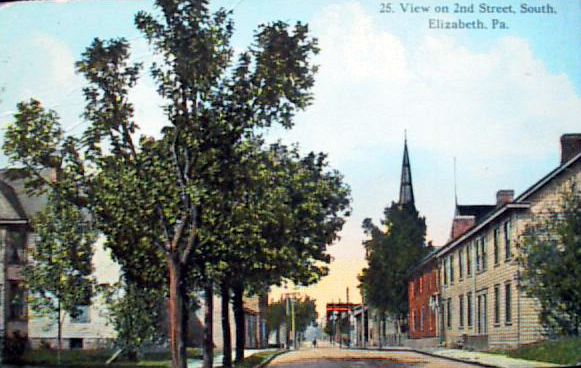 One of these homes can be seen in the last photo of the Elizabeth Public School Third Street below, possibility the home on the right of the first drawing above. 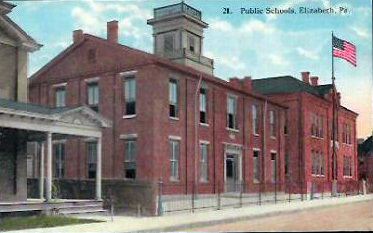 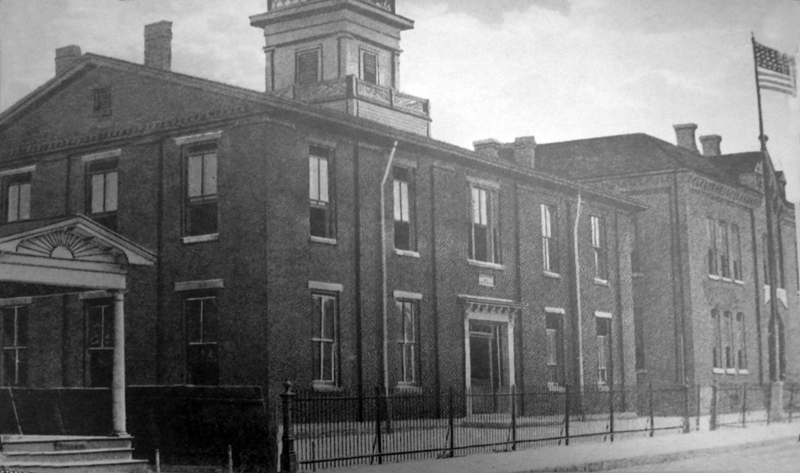 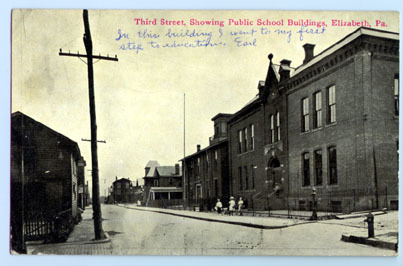 Photo showing the Third Street Elementary School was apparently taken from the roof of the Masonic Building located "katy-corner" from the school, and which still stands today. 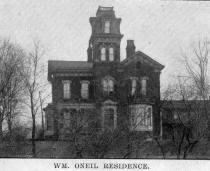 On the hill behind the school is the home and pavilion of W. W. O'Neil a prominent coal baron and boat owner. 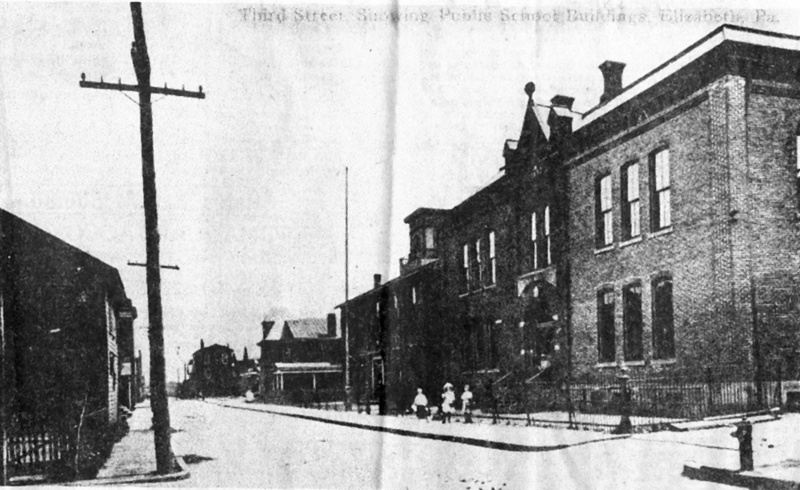 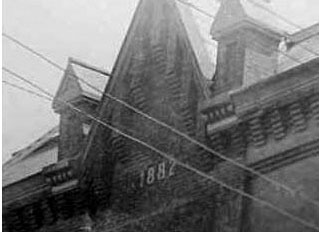 Amos Myers writes that the smoke behind the school is coming from Marraccini's warehouse as they roasted coffee and he noted that the odor was strong. 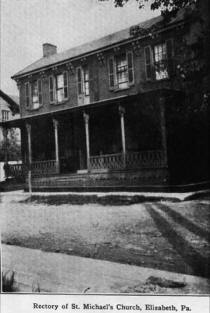 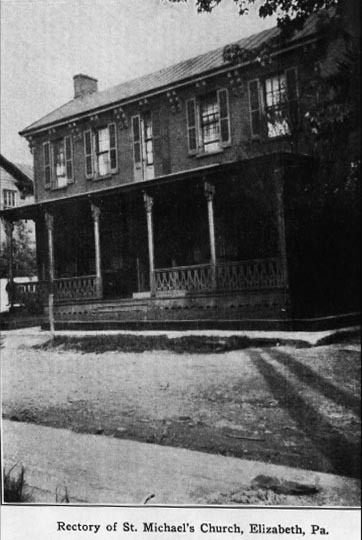 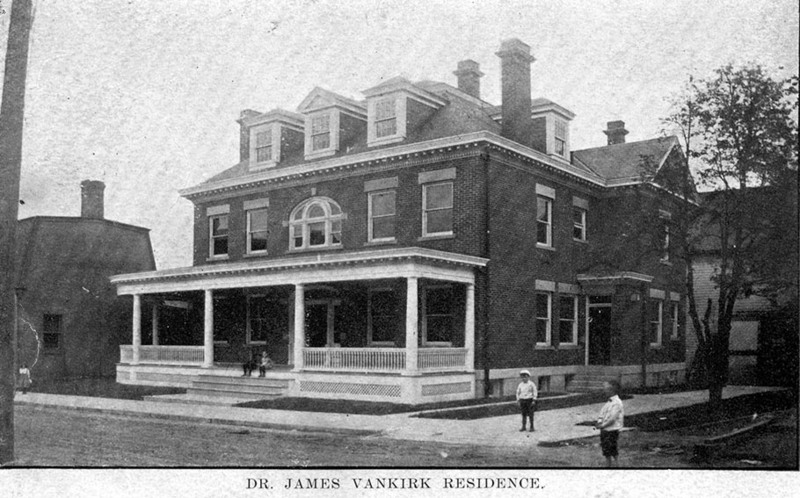 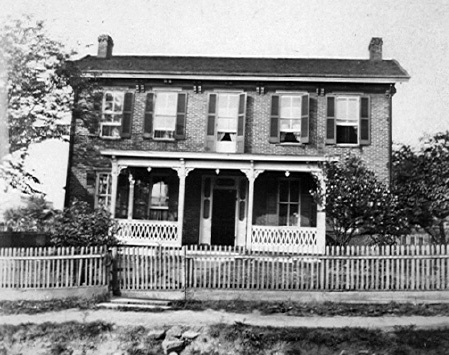 Amos lived on Tanner Avenue behind the school. 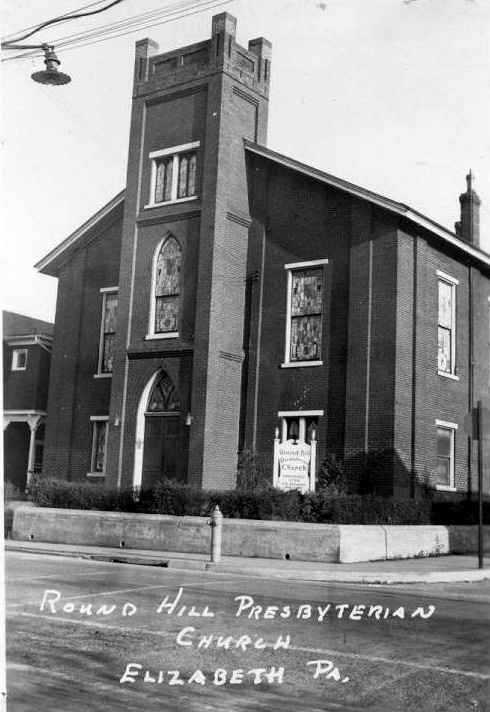 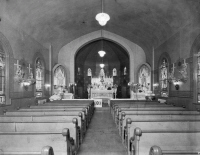 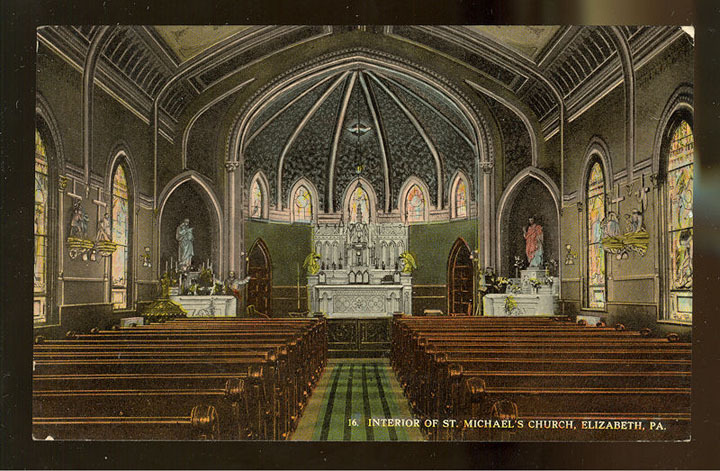 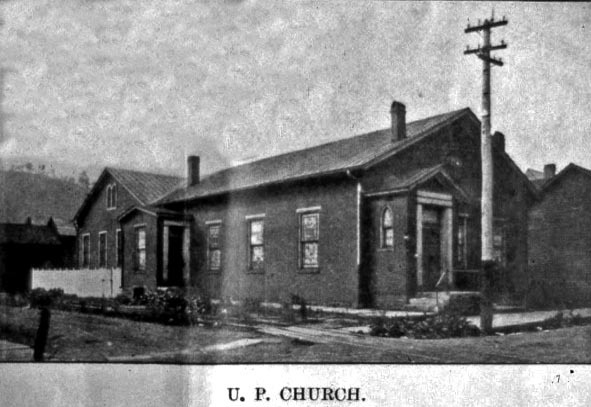 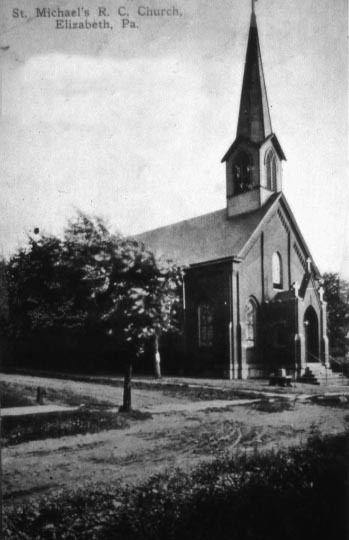 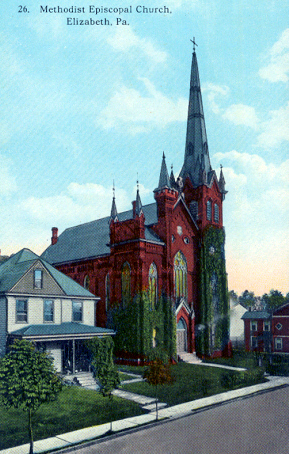 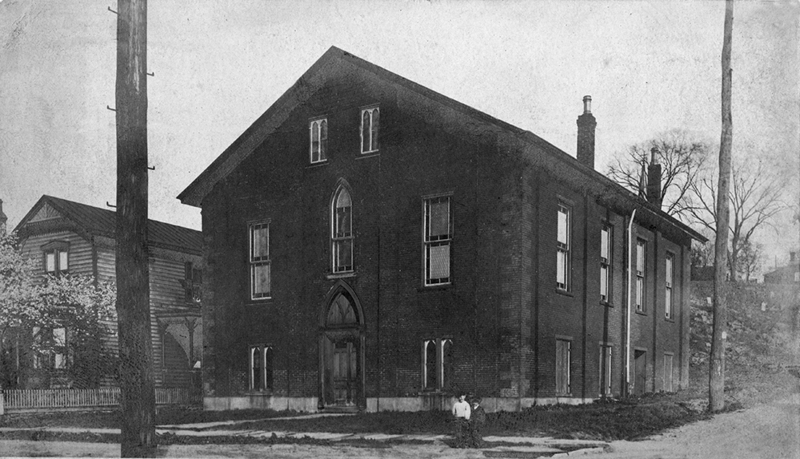 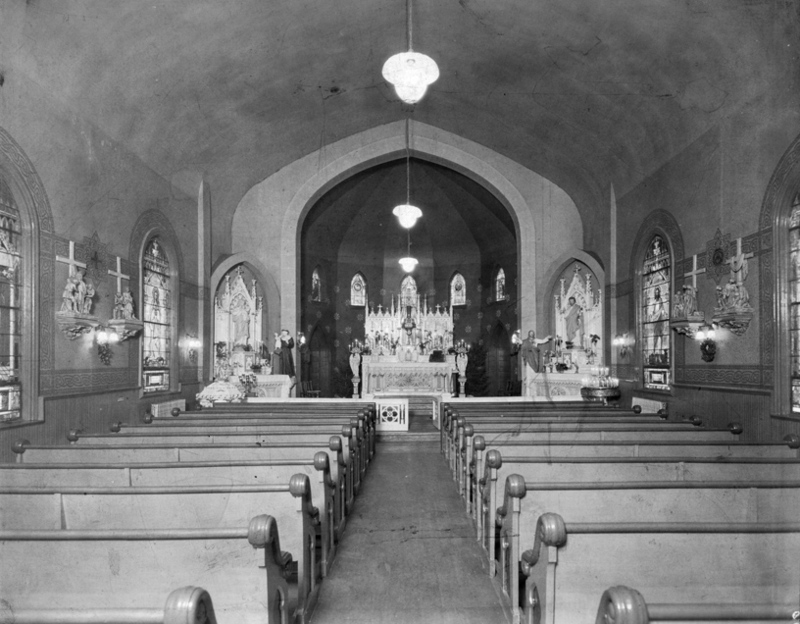 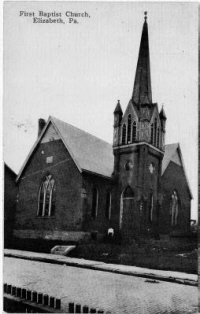 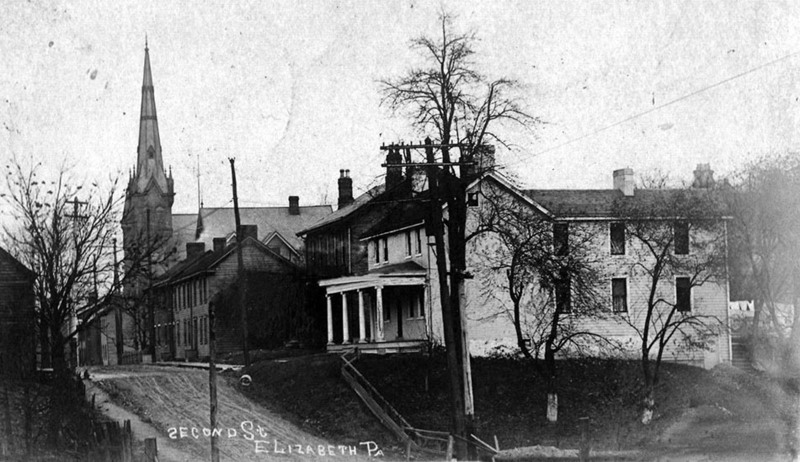 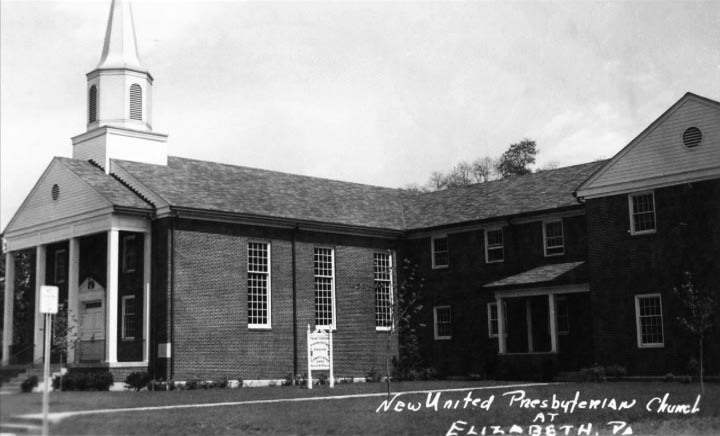 Photo of Presbyterian Church above left shows the building without the brick entrance as seen in next two photos, church records indicate this entrance was added during 1907. 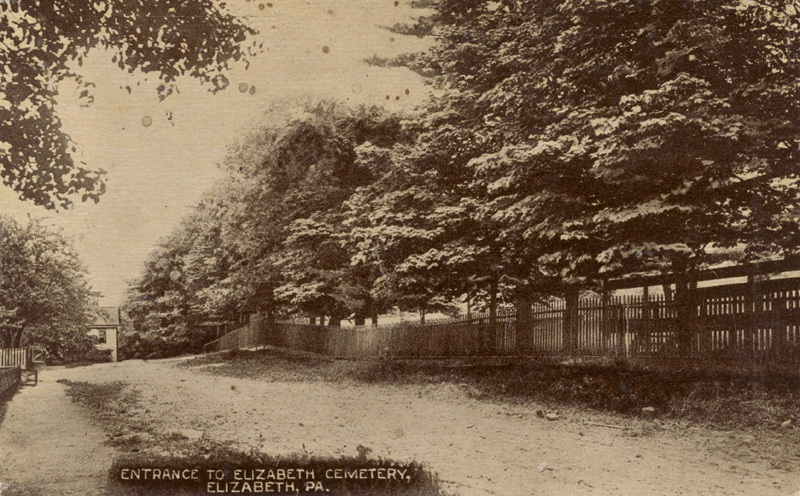 Also note that the Old Elizabeth Cemetery has a few headstones visible. 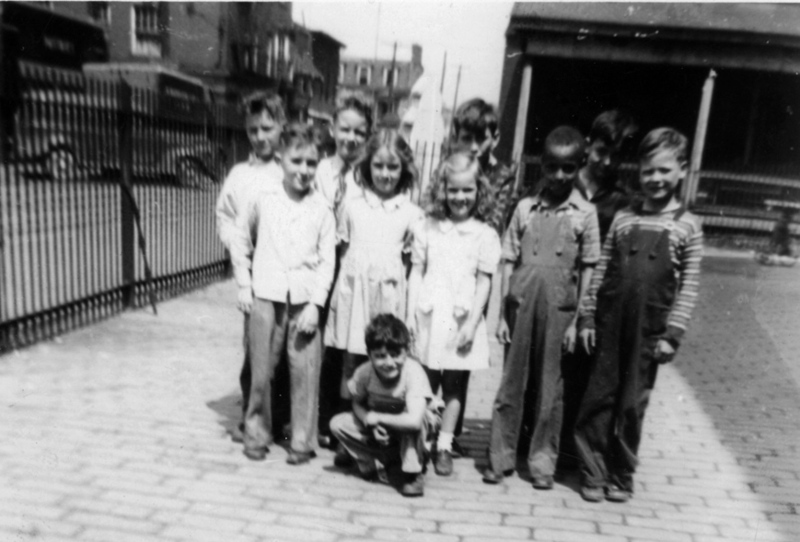 This photo is from the collection of Dorothy Trumbo II and made available by Barrett McAuliffe. 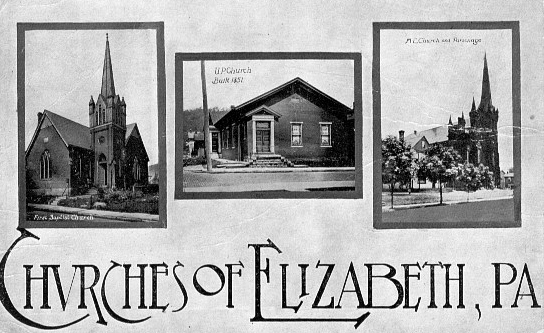 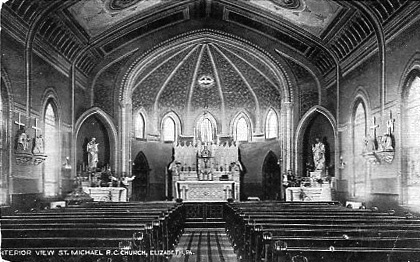 An additional Church related photo can be viewed at Elizabeth Teams & Groups. 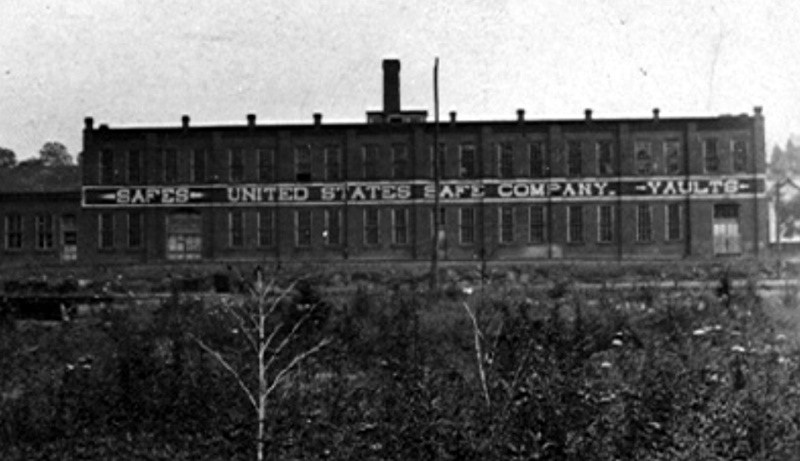 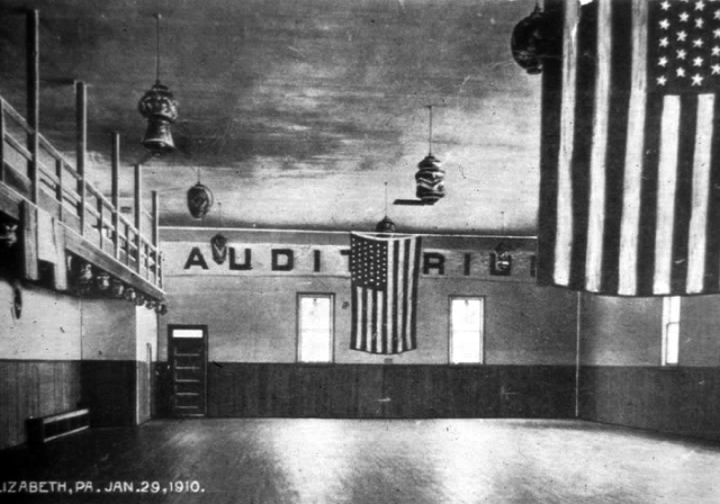 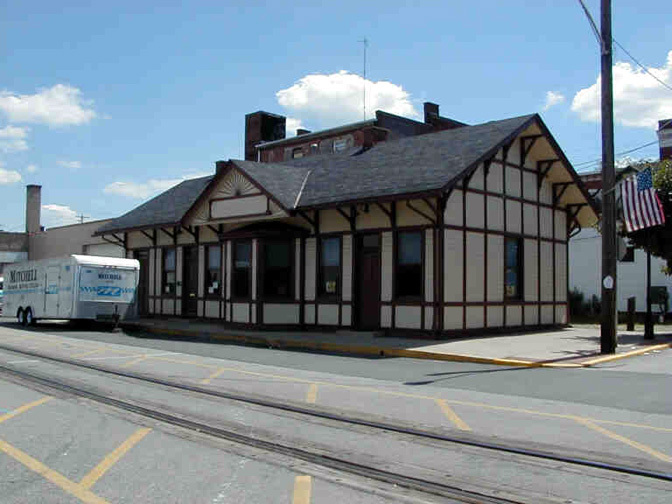 This building was built in 1892 and the United States Safe Company took over production of safes here in 1905. 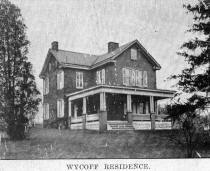 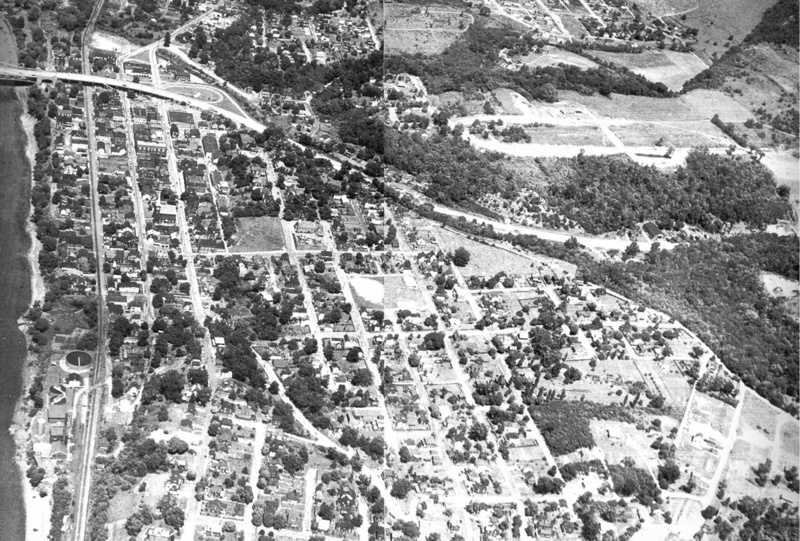 The location is in the area of the present day Wylie Field at the bottom of Blaine Hill. 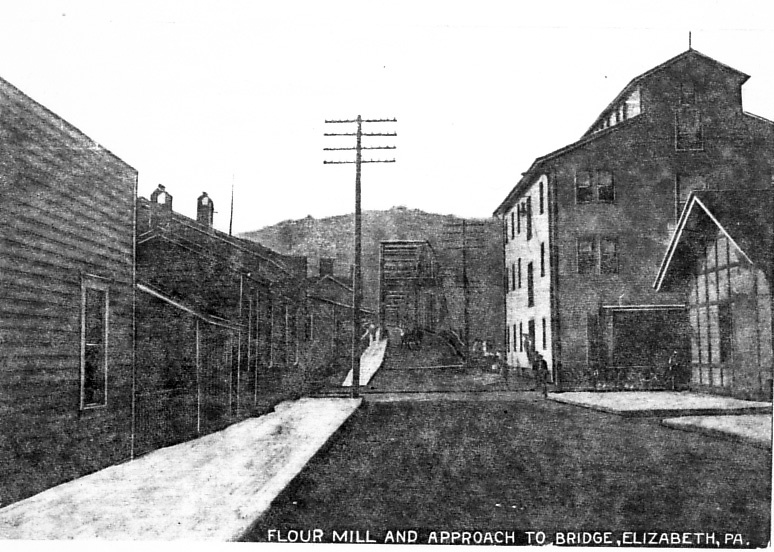 This location means the safe factory was very close, in fact next to the Elizabeth Marine Ways. 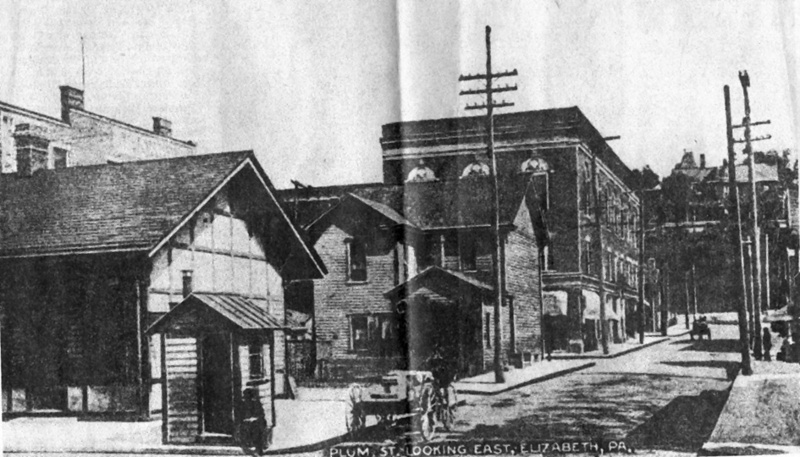 The photo on the right shows the EMW in the center of the photo, the large white building with a boat on the upper yard next to the white building. 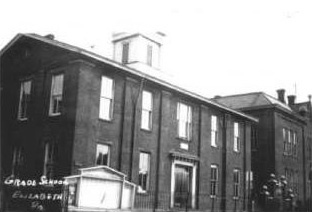 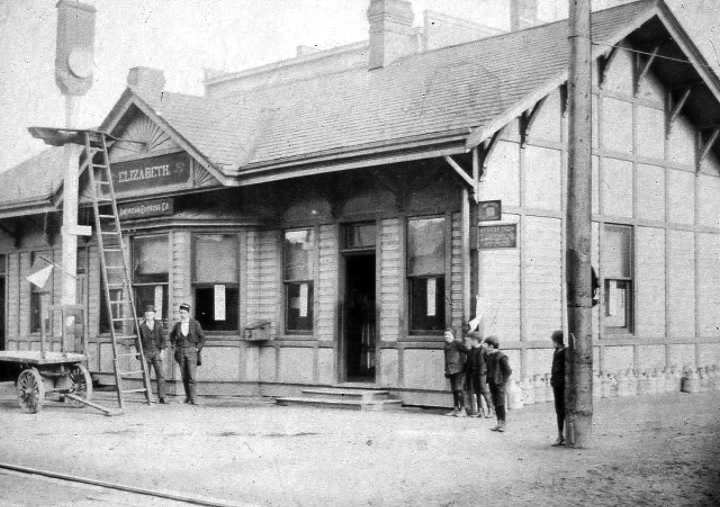 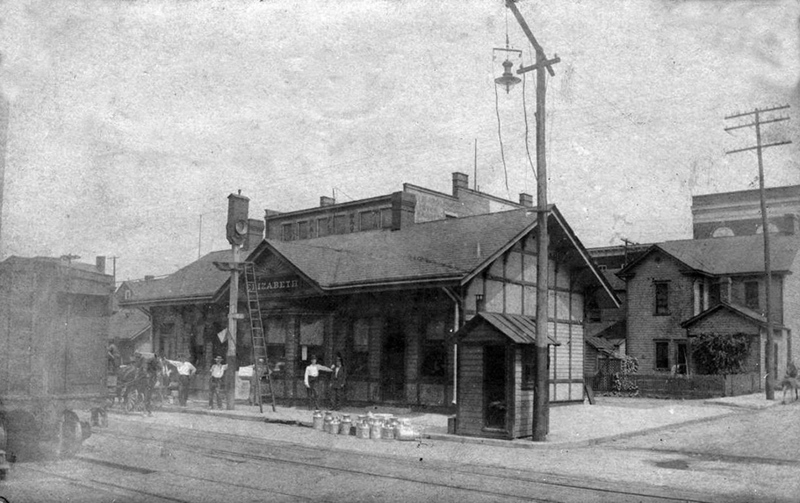 The Safe Works building was torn down during the 1930s. 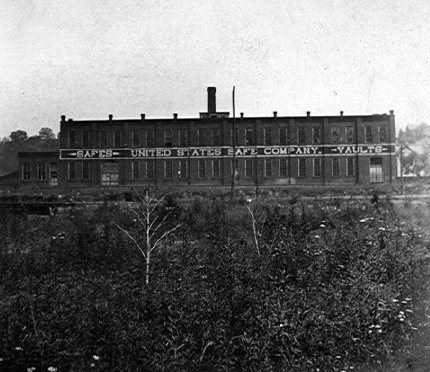 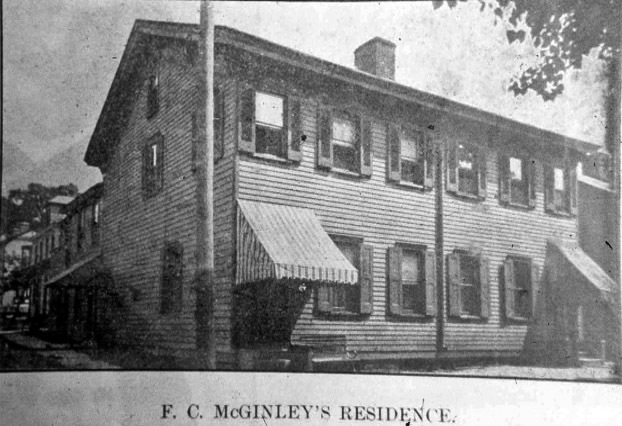 Glenn Meyers wrote that he cleaned 12,000 bricks from this building as a nine year old, earning $ 1.50 per thousand. 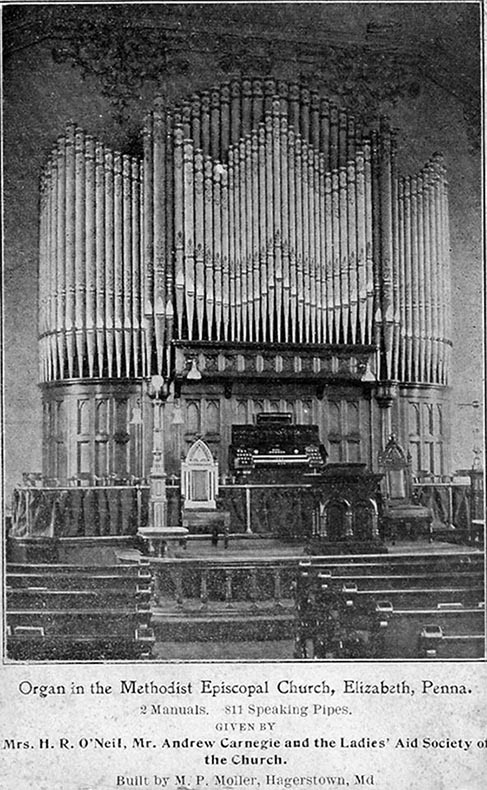 The photos above are from the collection of Kirk and Tetta Lynch Hall. 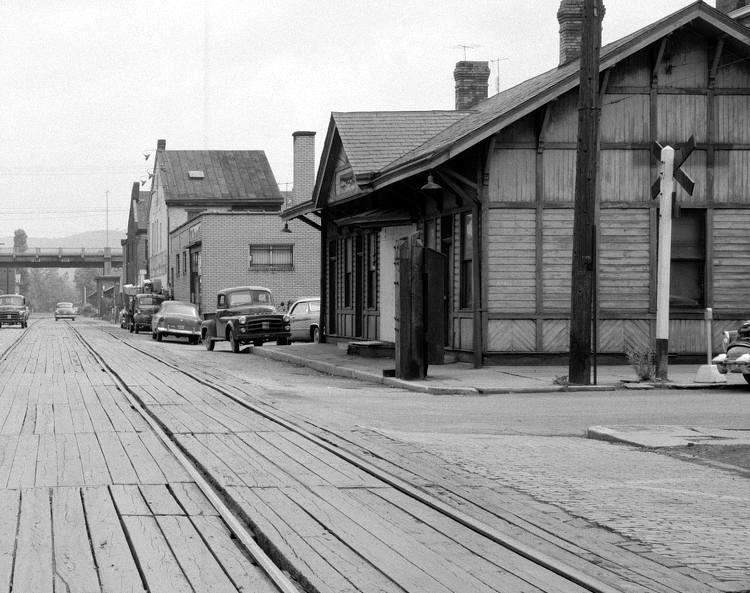 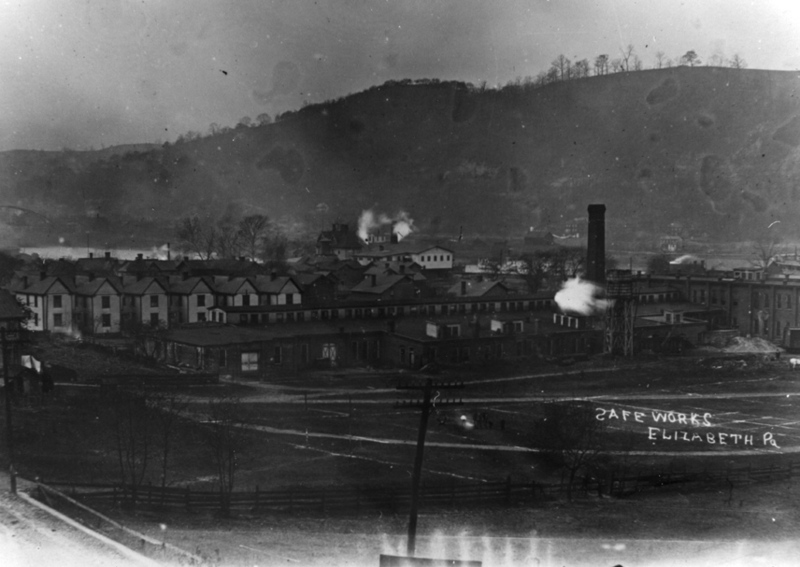 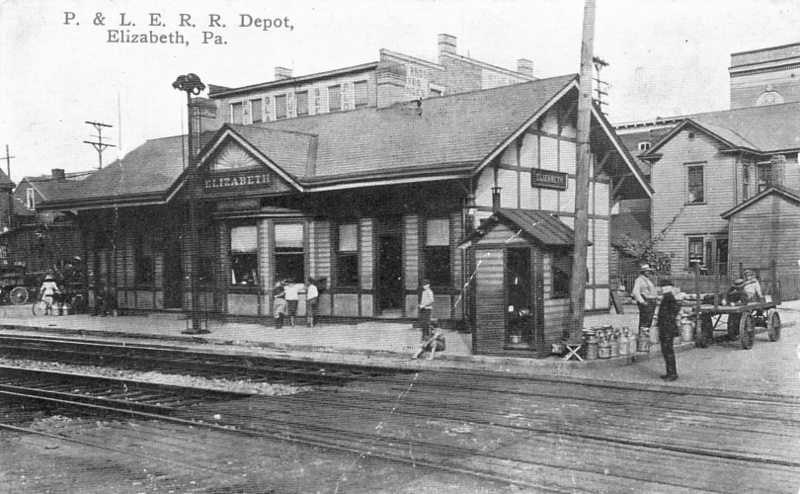 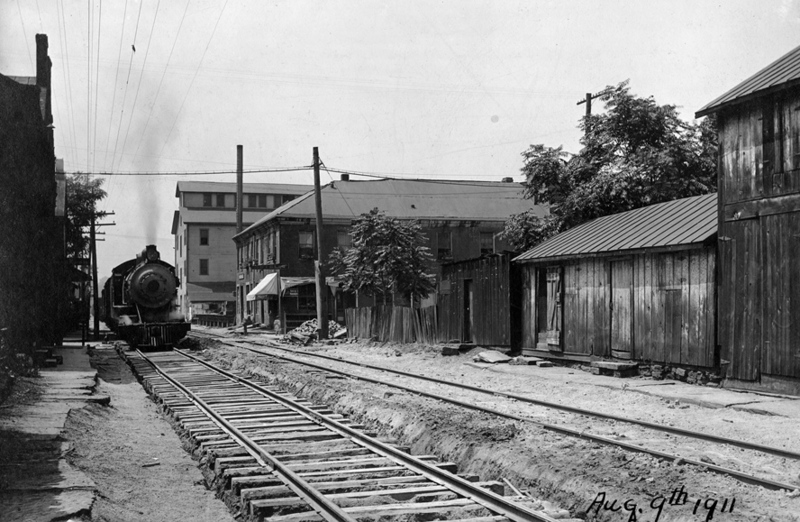 The seven photos below are from the Historic Pittsburgh Image Collections, donated to them by the Pittsburgh and Lake Erie Railroad. 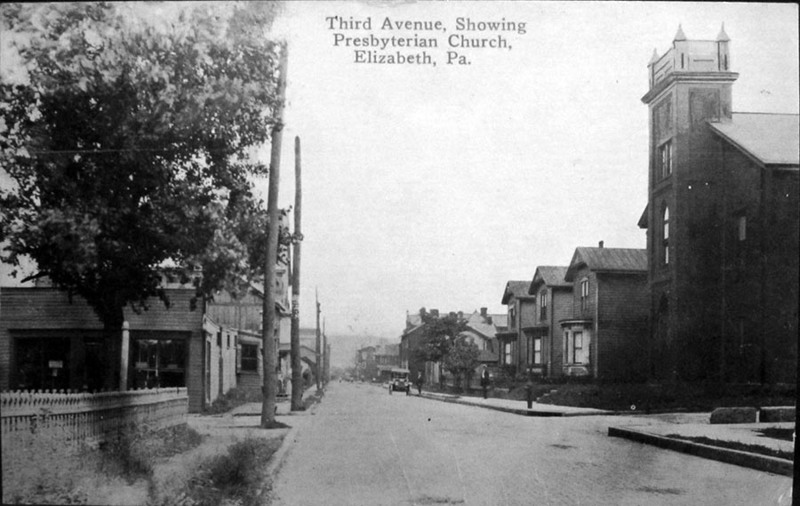 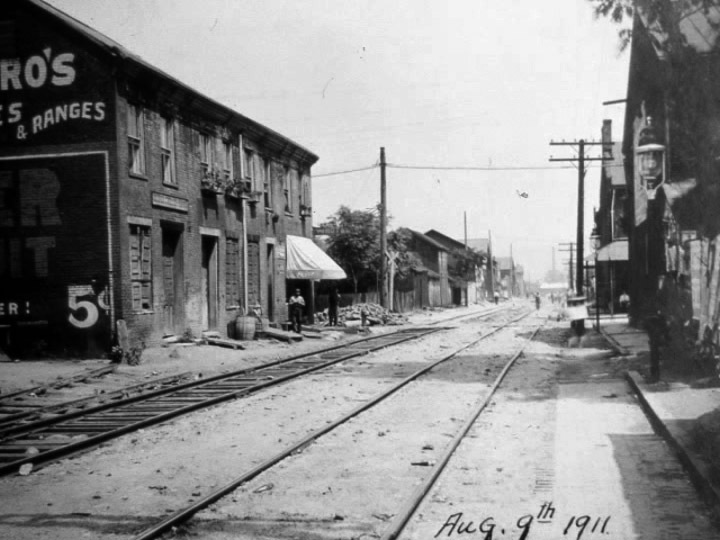 This set of photos will take you along 1st Avenue on July 18, 1911 and I am assuming they are showing the single railroad track running through Elizabeth during and prior to the installation of a second set of tracks to be used in addition to the existing set or as replacements for the existing set of tracks. 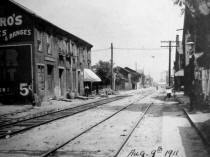 These photos appear to have been taken at the crossing streets of the tracks. 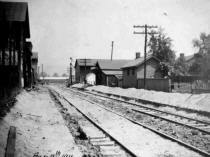 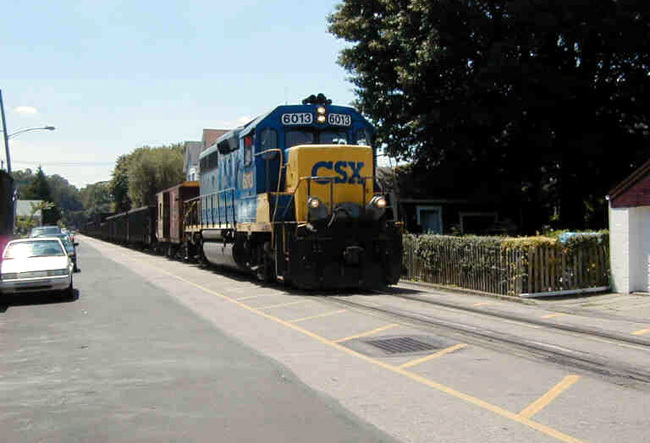 Note the first and last photos show work gangs and also track switching signal poles which might indicate that there were already two sets of tracks coming into and out of town and that a second set of tracks were about to be installed running through town. 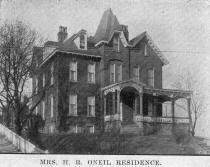 My assumption only. The photos below are dated August 1911, less than a month after the above seven photos were taken and appears to show a new set of tracks, based upon the earth work around the track and the new appearance of the ties. 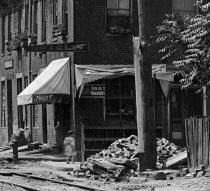 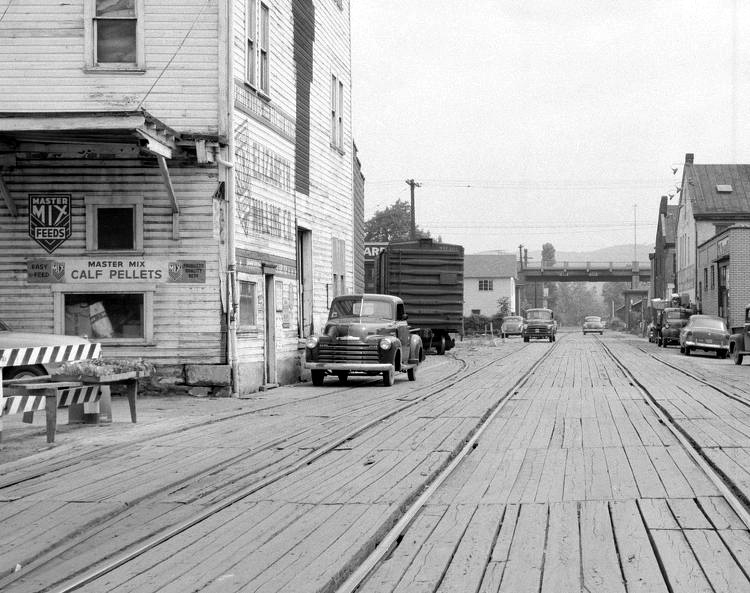 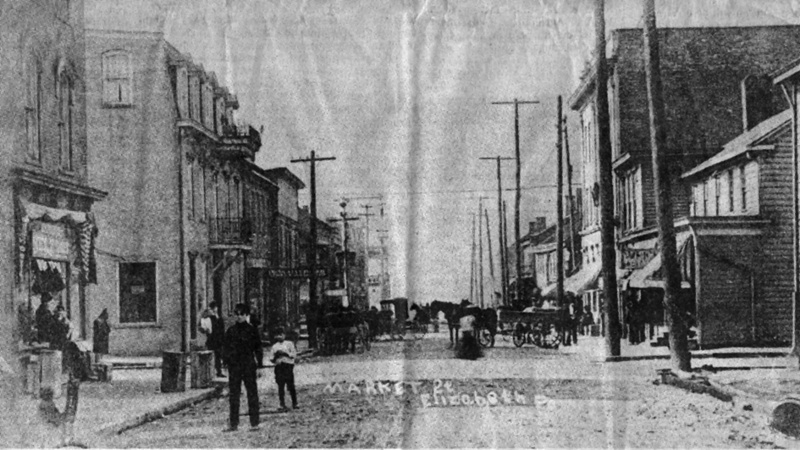 The background of the above photos shows the familiar Flour Mill but of interest is the building with an awning which is apparently a small store which sells fruit and also a Hotel, based upon the words written on the awning and building, note the little girl walking in front of the store. 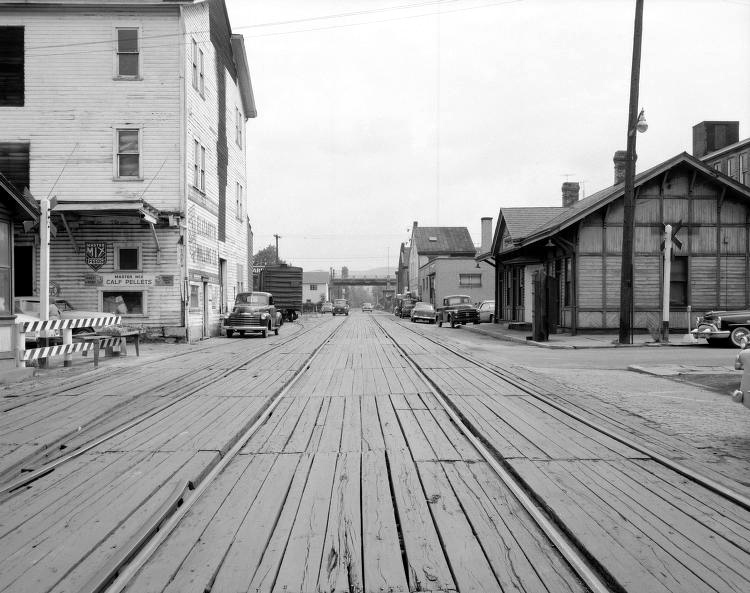 Below are similar scenes as above photos but with trains going thru Elizabeth on the again single set of tracks. 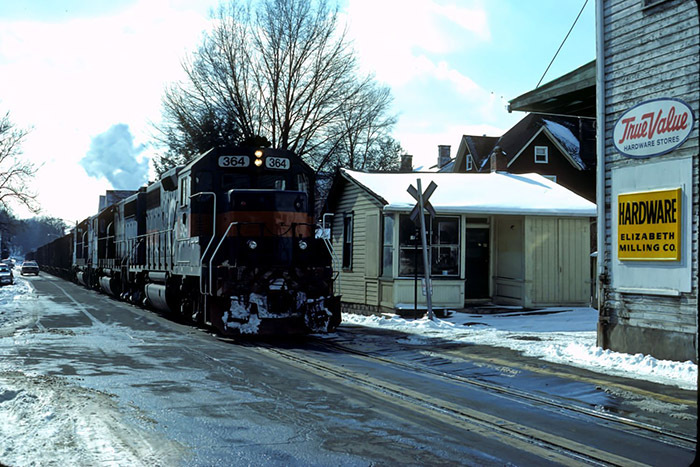 The photo on the left is dated February 1986 and the photo on the right during the early 2000s. 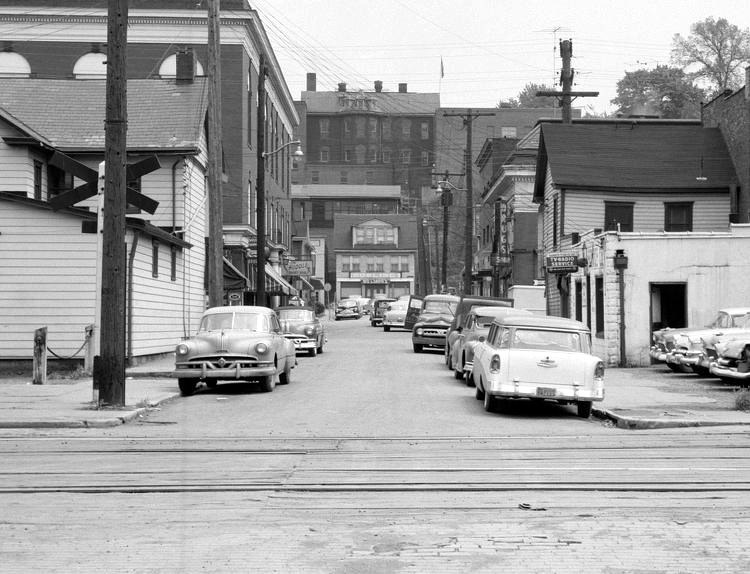 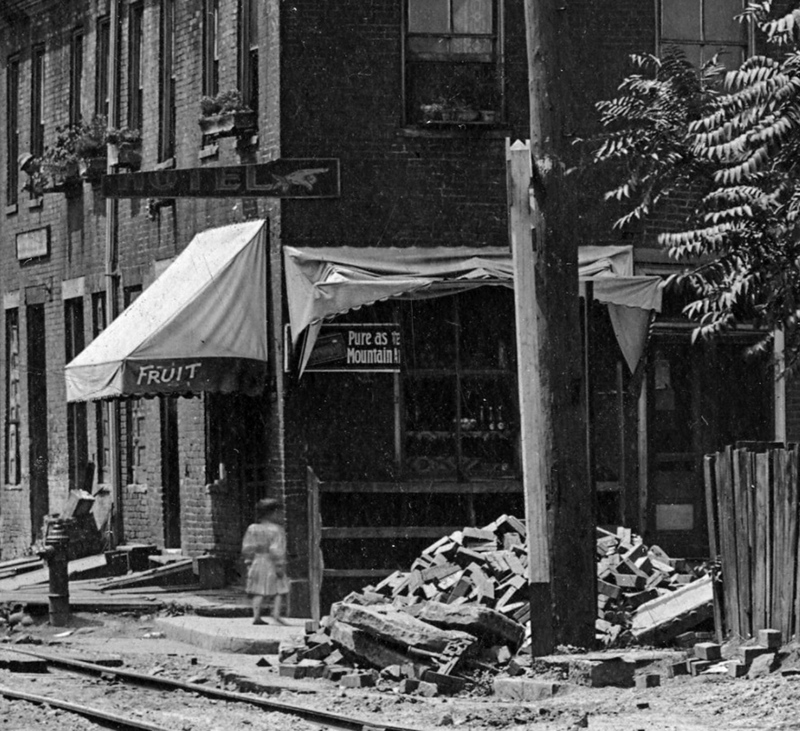 These photos are from the Historic Pittsburgh Image Collections. 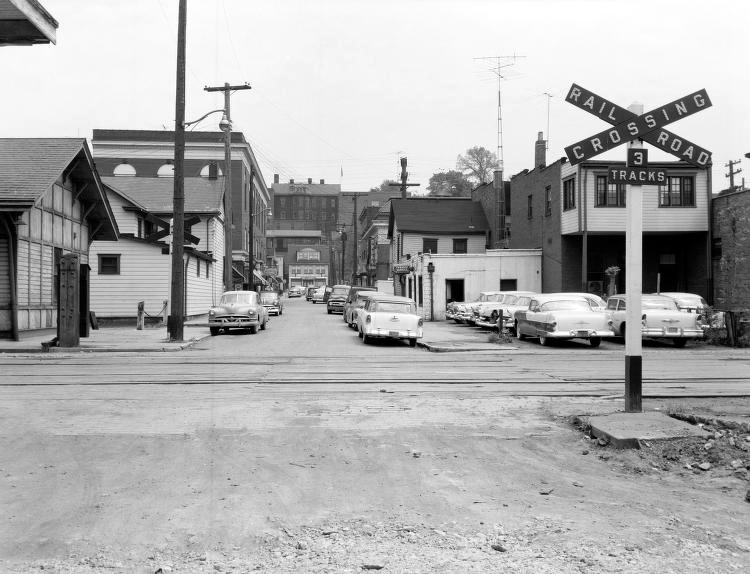 They are from the collection of Pittsburgh and Lake Erie Railroad and based upon the dates given on the two sets of photos were taken a year apart, May 1955 and 1956.